This coming Monday, God willing, I will have the opportunity to perform the Concerto for Alto Trombone and Orchestra by Johann Georg Albrechtsberger (1736-1809) with the Lafayette-Oxford-University Symphony Orchestra under the direction of Ronald F. Vernon, here on the campus of the University of Mississippi. While I have performed as a soloist with orchestras and bands on a number of occasions on the tenor trombone and euphonium, this will be my first time to do so on the alto trombone. Because this instrument and its repertoire might be unfamiliar to some of those that read my writings here, I have elected to use this week’s post to provide some background and information about the alto trombone, about Albrechtsberger, and about his trombone concerto. Austrian composer Johann Georg Albrechtsberger began his musical career as a choirboy in Klosterneuburg, where he also began study of organ and composition. He later continued both his work and studies at Melk Abbey. A very highly regarded theorist, composer, and organist in his day, he was organist of the Viennese Court, and Kapellmeister of St. Stephen’s Cathedral. He was considered by some, including Wolfgang Amadeus Mozart (1756-1791), to be the finest organist in the world. Albrechtsberger was the author of widely-used treatises on composition and figured bass, and was a diligent student and champion of contrapuntal writing, particularly the fugue. 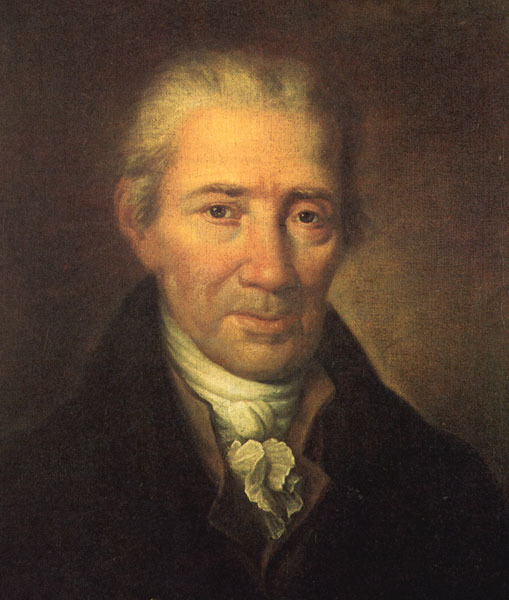 He was a friend of Mozart and of Franz Joseph Haydn (1732-1809), the latter of which sent his student, Ludwig van Beethoven (1770-1827) to Albrechtsberger for further training in counterpoint. This training became especially evident in Beethoven’s later works, which made such masterful use of the fugue. While Albrechtsberger’s later works made increasing use of fugal writing, his earlier works reflected the galant style which was prevalent during his early adult years. This music, partly as a reaction against the intense and complex polyphony that characterized the late Baroque, was homophonic, highly ornamented, and, well, “frilly.” This also is the style of his alto trombone concerto. The alto trombone, however, is much less common, and to the uninitiated it looks like a “baby trombone,” or perhaps a tenor trombone that was left out in the rain and shrunk a bit. Its fundamental pitch is E-flat, a perfect fourth higher than the tenor trombone. This instrument is used when a lighter sound than that of the tenor trombone is needed, with greater facility in the upper register. I have most commonly used the alto trombone when playing first trombone in symphony orchestras when eighteenth and some nineteenth-century repertoire was programmed, including the Mozart Requiem, the Haydn Creation, symphonies by Beethoven and Schubert, and occasionally even Brahms symphonies, depending upon the preferences of the conductor. When combined with smaller instruments in the rest of the trombone section—say, a small-bore tenor trombone on the second part and a large-bore tenor trombone serving as a “small bass trombone”—the alto trombone lends an ideal top to a smaller, “Classical” trombone section, providing a light and colorful sound appropriate for the works of composers that never intended the powerful, penetrating brass sound envisioned by Wagner, Mahler, and Strauss. All of that said, my desire is to give a compelling and enjoyable performance, not pursue absolute historical accuracy from an organological perspective. The E-flat alto trombone provides the ease of execution and the quality of tone I am seeking for this performance, so that is the instrument I will use! Weiner, Howard. “When is an Alto Trombone an Alto Trombone? When is a Bass Trombone a Bass Trombone?—The Makeup of the Trombone Section in Eighteenth- and Early Nineteenth-Century Orchestras.” HISTORIC BRASS SOCIETY JOURNAL 17 (2005), 37-79. Wigness, C. Robert. THE SOLOISTIC USE OF THE TROMBONE IN EIGHTEENTH-CENTURY VIENNA. Nashville, Tennessee: The Brass Press, 1978. As mentioned above, Albrechtsberger’s alto trombone concerto is typical of the galant style. Consisting primarily of simple, homophonic melodies, the accompaniment is essentially two violin parts and basso continuo, which will be provided by cellos, basses, and harpsichord. This also was typical of works from the period; the use of the basso continuo, that staple of Baroque music, with the harpsichord playing an important role in the orchestra, lingered well into what we sometimes call the “Classical” period. Albrechtsberger appears to have conceived the work as a chamber piece, though we will be using full string orchestra (minus violas). In my experience, this is not unusual for performances of the Albrechtsberger with modern orchestras. The trombone writing is not what most people would expect from a trombone concerto, particularly if the listener is accustomed to hearing the loud, bombastic trombone playing that characterizes the writing of late Romantic composers in particular. Like the string parts, the solo part also is light, “frilly,” and highly ornamented, with trills and other ornaments frequently occurring in the trombone part as well as in the strings. This provides a central challenge of performing the piece, as the trombonist must execute difficult ornamental work as well as sustained high register playing, and yet at the same time maintain a light and delicate approach. This really is a delightful piece. I truly hope that it will be both well-executed and well-received. The rest of the program includes one of Mozart’s symphonies (I will confess that I do not know which one), the Simple Symphony by Benjamin Britten (1913-1976), and selections from Antonín Dvořák’s (1841-1904) Slavonic Dances. The performance will be on Monday, October 22, at 8:00pm, in the Gertrude C. Ford Center for the Performing Arts on the campus of the University of Mississippi. Admission is $10.00 If you live in the area, I hope you will make plans to attend! This entry was posted in Alto Trombone, Music, Repertoire, Trombone. Bookmark the permalink.